Industry - wide adoption of Autodesk design and collaboration software to boost manufacturing competitiveness and benefit up to 100,000 engineering professionals. 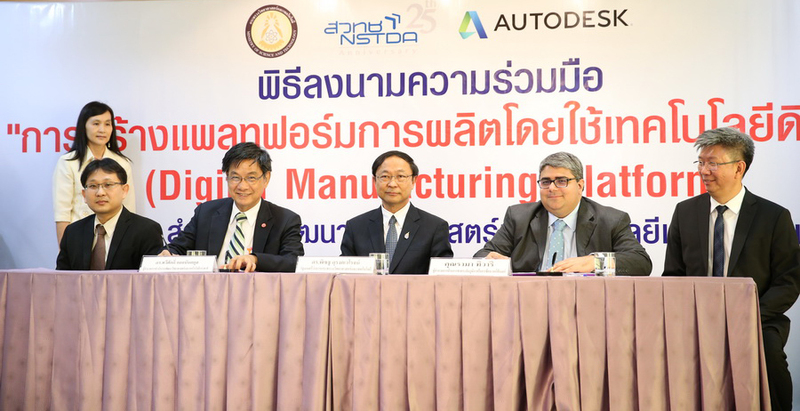 Bangkok, May 25, 2016 - The National Science and Technology Development Agency (NSTDA), The Ministry of Science and Technology, and Autodesk today signed a Memorandum of Understanding (MOU) to help advance Thailand’s Manufacturing competitiveness trough industry-wide adoption of leading edge 3D technologies and digital manufacturing capabilities. Mr.Rama Tiwari, Regional director of sales, Autodesk ASEAN said, “Technologies like the internet of things, augmented and virtual reality, robotics and additive manufacturing are disrupting the industry. The Digital Manufacturing Platform gives local talent and companies the tools to platform every link in manufacturing value chain, and the opportunity for Thailand to lead in the future of making things."